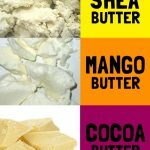 How to Use Cocoa Butter on Your Face for Best Results - beautymunsta - free natural beauty hacks and more! Cocoa butter, also known as Theobroma oil, is solid at room temperature. Extracted from the cocoa bean plant, native to South America, cocoa butter is packed with nutrients. Cocoa butter contains many compounds such as antioxidants, which make it very beneficial for skin. 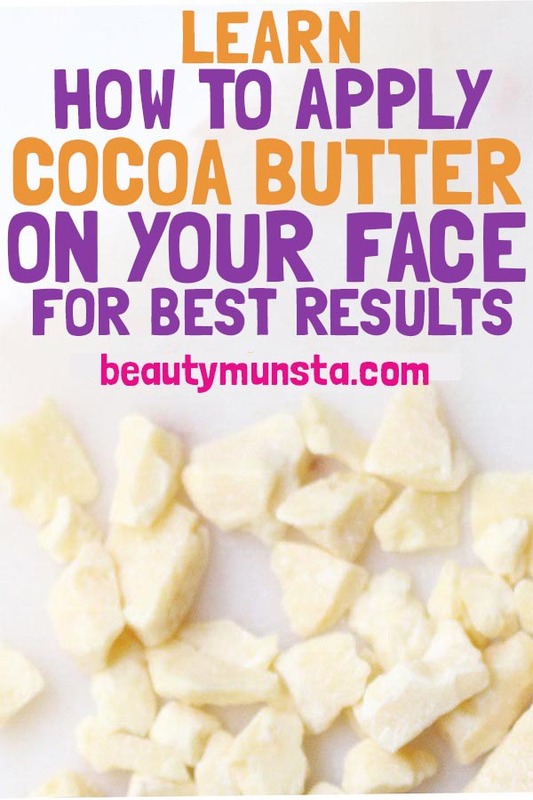 Learn how to use cocoa butter on your face for best results. Moisturizer: Cocoa butter is an excellent moisturizer for your skin. That’s why it is contained in many body lotions. It will keep your skin moisturized for hours. Sealant: Did you know that cocoa butter contains a percentage of natural wax? 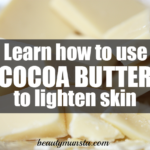 This helps lock in the moisturizing properties of cocoa butter on your skin. Anti-aging: Cocoa butter contains essential fatty acids and many antioxidant compounds which help reduce wrinkles and fine lines on your face. Cocoa butter will keep your skin young and supple. Reduces blemishes: If you have blemishes on your skin, cocoa butter is a great treatment to help fade those dark marks fast. Evens out skin: Those with hyperpigmentation on the face will find that cocoa butter will even out the skin tone and make your complexion more smooth. For chapped lips: The sealant qualities, together with the moisturizing properties, make cocoa butter an excellent remedy for chapped lips. Removes stretch marks: This is perhaps cocoa butter’s most well-known effect on skin – it helps prevent stretchmarks. 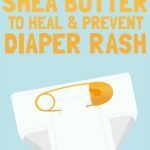 Even if stretch marks have already formed, cocoa butter is efficient and reducing the appearance of stretch marks. First of all, make sure you buy high quality raw, unprocessed cocoa butter to apply on your face. Once you have washed your face with a cleanser, pat your face dry. Use a hair band to keep baby hairs off your face. Scoop out a pea sized amount of cocoa butter and rub it between your palms. Your body heat will easily melt the cocoa butter. Now apply the cocoa butter all over your face in a circular motion. Avoid rubbing your skin too tightly or in a downward motion, as this will create wrinkles. Rub the excess cocoa butter on your palm, along your neck in an upwards motion. How often should you apply cocoa butter to your face? 1 – 2 times a day is just fine. However, feel free to apply it up to 3 times a day for extremely dry skin or for scar removal. Can I apply cocoa butter to my face at night? Yes, you absolutely can! In fact, I recommend you apply cocoa butter to your skin at night. Find out why here: Can You Apply Cocoa Butter on Your Face At Night? 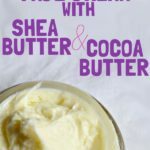 Make your own cocoa butter face cream: Why do you have to pay arm and limb for a branded face cream when you can make your own?! It’s very easy to make your own cocoa butter face cream. Here’s an recipe: DIY Cocoa Butter Face Cream for Anti-Aging and Skin Repair. 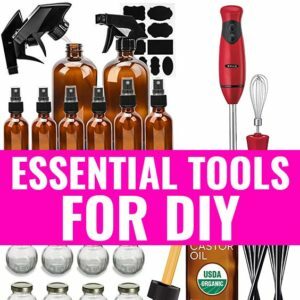 Other face cream recipes I’ve made can be found here: How to Make Vitamin E Face Cream, Homemade Face Cream with Shea Butter and Homemade Face Moisturizer with SPF. Allergic to cocoa butter? As wonderful as cocoa butter is, you must exercise caution when applying any product to your face. 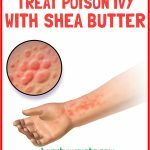 Those with possible cocoa butter allergy, should stay away from products containing cocoa butter. Read the product ingredient list to see if cocoa butter is listed as the first 5 ingredients. Cocoa butter for acne: Be informed that cocoa butter is high on the list of comedogenic ingredients. Check out the full List of Comedogenic Oils to avoid for acne and oily skin What this means is that cocoa butter has tightly packed molecules. This gives it has a higher chance of clogging pores and creating comedones, or pimples. If you are prone to acne, it’s better to stay away from cocoa butter. You can still use products that don’t list cocoa butter in the first 5 ingredients, even though cocoa butter may appear later down the ingredient list. Rancid cocoa butter: If your cocoa butter was not stored properly, or if it’s too old, do not use it on your skin. You’ll be able to tell that it’s rancid by the smell. Natural cocoa butter does have a nutty scent. But if it’s rancid, it will smell “off”. Using rancid products on your face will increase the oxidative stress on your skin, creating free radicals that will damage cells and make them age faster.